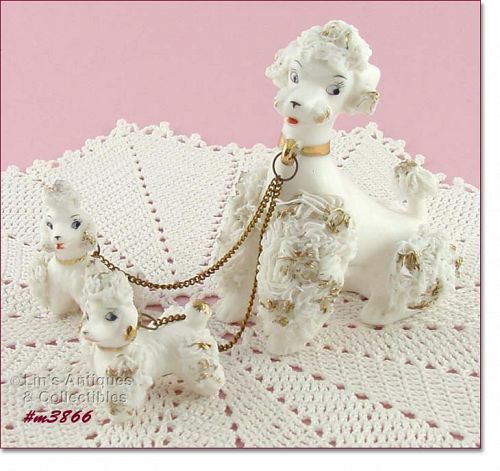 Super cute and super condition pair of white spaghetti poodles! They measure 5” tall (at tallest), 4 ½” – 4 ¾” long (front foot to back foot), and were made by Lipper and Mann. 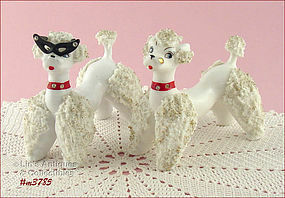 These are nice size poodles and are gorgeous! This is a cute spaghetti poodle! 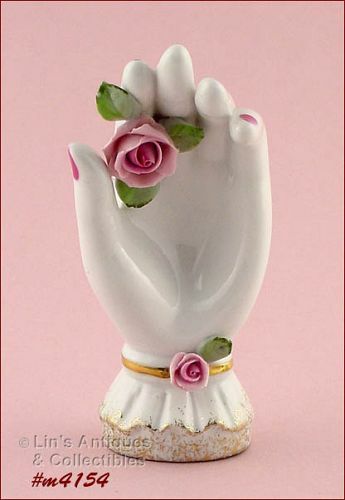 It measures 3 ½” tall (at tallest), 4 3/8” long (at longest) and is in super condition – no chips, no cracks, does have minor pink color loss on the “bow”. Neat item, an unusual find! Purchased several years ago at a local antique ship, this is a Lefton Colonial Lady figurine! She measures 7 ¼” tall (at tallest) and still has the red and gold Lefton foil sticker. Bottom also has “Geo. Z. Lefton, KW10534”. 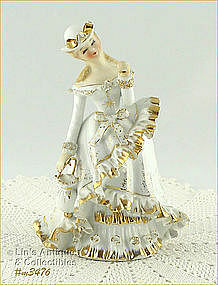 Figurine is in wonderful condition – there are a coupe teeny, teeny dings on skirt ruffle and she has lost her umbrella. Very pretty addition to a lady collection! This is a very collectible item that is difficult to find! 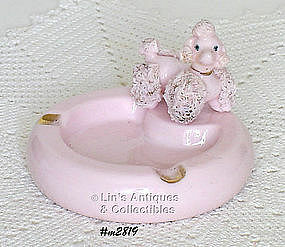 Made by Lefton, this is a pink ashtray with an attached pink spaghetti poodle. Super condition with minor wear t the gold color – that’s it! There is a small rough place on edge that is production – has color and glaze – not detrimental. Super collectible! Excellent condition Lefton figurine! 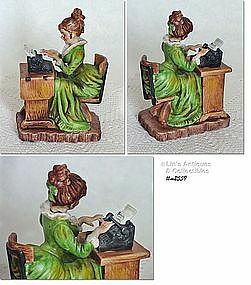 This one is titled “Typist”, measures 6 ¾” tall, and is number 5688. it has the red and gold foil sticker/label. This figuring is shown in Karen Barton’s “Twentieth Century Lefton China and Collectibles” with a 2001 price guide value of $75.00. 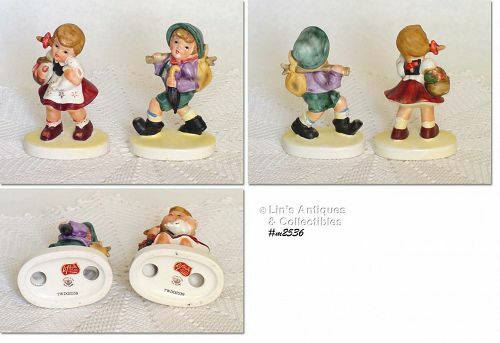 These Lefton figurines are adorable! They are described in reference books as “Hummel-like” and indeed they are. 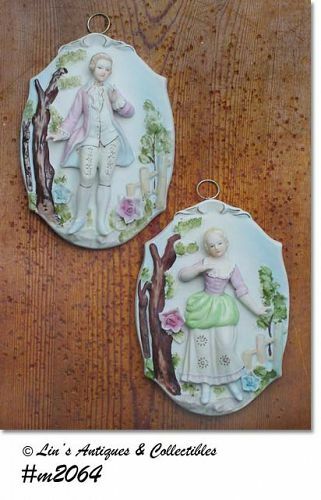 Figurines measure 4 ½” tall, both have original Lefton foil stickers/labels, and are stamped Lefton China, Hand Painted. They are both numbered TWD02539. Excellent condition! These Lefton wall plaques are so nice -- Ttey’re oval shaped and measure 6 ¾” long, 5” wide (at center)! One plaque has a lovely colonial lady, the other has a handsome colonial man. The detail is outstanding and both are in excellent condition (the Lefton stickers have been removed). Plaques have no chips, no cracks, no dings – you’ll love them! 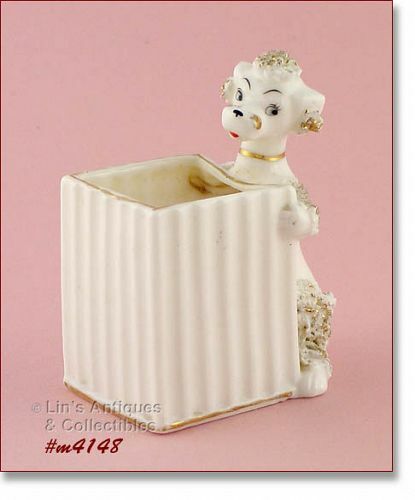 This listing has a beautiful lady figurine made by Lefton! Her dress is pink and white, her hat/bonnet is pink, and she’s carrying a blue striped hatbox/purse. Measures 6 ½” tall and has the red and silver Lefton label on bottom. Mint condition!! 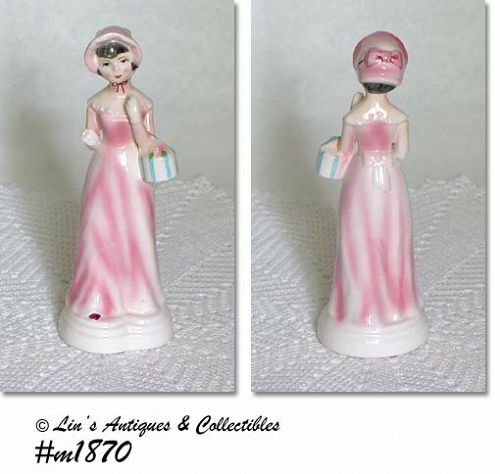 Another Lefton cutie – a girl figurine with a basket of flowers! 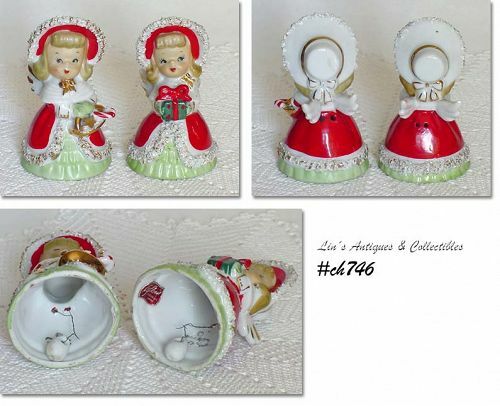 Measures 4 5/8” tall and stamped on bottom: Lefton China, handpainted, KW25234. Lovely and in excellent condition! 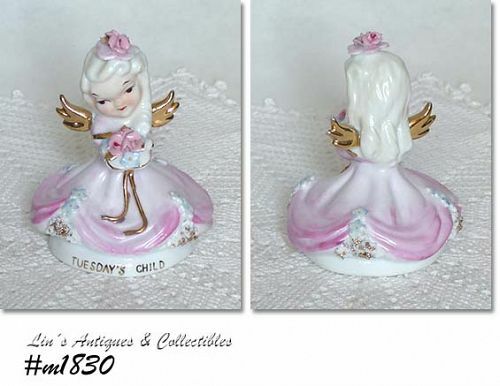 This is a cutie -- made by Lefton, this is “Tuesday’s Child” angel figurine! 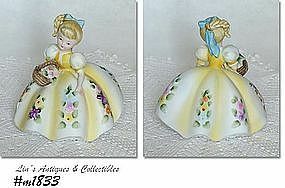 She measures 4 ¼” tall, marked on bottom: Lefton China, hand painted, K8281. Angel is in wonderful condition – the only “use” evidence I could find is a broken gold leaf tip in her bouquet and 2 broken gold leaf tips on the flower in her hair. Beautiful item, priced to reflect imperfection. 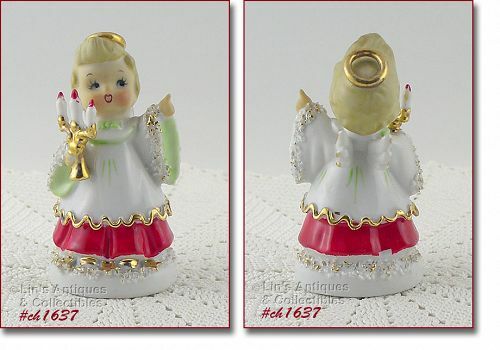 This listing has 2 lovely angel bells made by Lefton! One girl holds a prettily wrapped package and the other has a handled basket that “holds” a star shaped cookie and a candy cane. They measure 4 3/8” and are stamped on inside: Geo. Z. Lefton. THIS IS AN EXCEPTIONAL SPAGHETTI ANIMAL LISTING! PER REFERENCE MATERIALS, THEY'RE LEFTON PRODUCTIONS. BOTH ARE PINK WITH DARKER PINK FACIAL FEATURES, EACH "WEARS" A GOLD COLOR BOW, AND ARE ACCENTED WITH WHITE SPAGHETTI WITH GOLD TRIM. 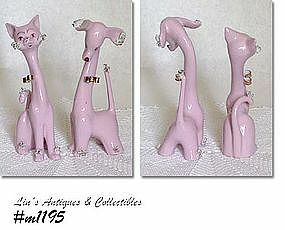 DOG MEASURES 7 1/2" TALL (AT TALLEST), CAT IS 7 3/8" TALL (AT TALLEST). THESE HAVE A MODERN STYLING AND ARE VERY PRETTY! MINT CONDITION -- LOOK NEW. 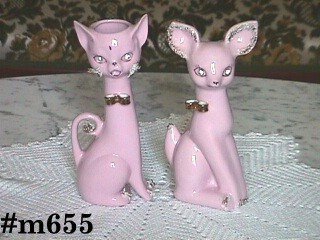 LEFTON TALL SPAGHETTI CAT AND DEER VASES!